Rabbi Dr. Eugene Korn is a graduate of Yeshiva College and studied at RIETS. He was ordained by the Israeli rabbinate and earned a doctorate in philosophy from Columbia University. He was founding editor of The Edah Journal/Meorot for 12 years. Today he lives in Jerusalem, where he is the Academic Director of the Center for Jewish-Christian Understanding in Israel. This article appears in issue 28 of Conversations, the journal of the Institute for Jewish Ideas and Ideals. For the past 15 years, I have toiled in the vineyards of Jewish-Christian relations, trying to carve out an ennobling Torah path toward my interactions with non-Jews. Can I see Tzelem Elokim in the face of a gentile Other? If so, how does this shared divine endowment guide our relationship? And perhaps more important, how does it shape my religious commitment to the Torah's demand that Jews play a crucial role in sacred history? I came to Orthodoxy from the outside—from an ethnically Jewish home in a typical American pluralistic New Jersey suburb. There I learned early that non-Jews were not so different from Jews. Some were refined, others coarse; some were moral, others not. And just like Jews, they were idealistic and pragmatic, smart and intellectually dull, sensitive and unresponsive. Experience taught me that there is no essential difference between Jews and gentiles and that I can learn important life lessons from people beyond the daled amot of our Jewish community. These lessons have been repeatedly confirmed in my adult life, so that now I hold these convictions so deeply that no text, no rabbi, nor any halakhic opinion can convince me otherwise. I have been indelibly touched by modernity and its values of equality, autonomy, universal human rights, freedom, and pluralism. They are essential to my spiritual life and deep sense of self. For better or worse, I do not pine for pre-Emancipation times when Jews were largely insulated from broader human culture, when rabbinic authority had no competition for truth, when there was no Jewish alternative to Orthodoxy (although the term “Orthodoxy” was first coined in response to modernity), and when secular ethics were unthinkable. To the contrary, I yearn to be open to all humanity and constructive human culture. There is much beauty in Orthodoxy and its Torah: the warmth of community and the calming guidance of a structured life in the face of the chaos of postmodern culture, routine selfless acts of hesed that nourish the better angels of our souls, dedication to living according to principles and values, striving for God and transcendence—in sum, a life committed to meaning and helping others. Yet there is much in Orthodox life that runs counter to modern values. From the time I grew committed to Torah and its halakhic expressions, retaining my commitment to modern values has not been an easy journey. At times it led me to profound spiritual restlessness and cognitive dissonance. It has sometimes put me at odds with popular attitudes in our Orthodox community, and brought me into conflict with well accepted halakhic positions that were formulated in pre-modern times when the dominant Jewish assumptions were that "gentiles always treat us brutally," that “Jewish belief is more reasonable than Christianity,” and that "religious Christians want only to convert Jews." Rooted in Jewish historical experience, those assumptions differed radically from my personal relationships with Christians that were regularly characterized by dignity, respect, and equality. Despite the tensions, the conflict has been redemptive, forcing me to better understand the mystery of others even as I ponder our differences and sameness. In the end, this struggle has proven to be a blessing because it broadened my spiritual world and taught me to understand myself and the Torah more deeply. My interest in interfaith relations grew out of a near instinctive dedication to ethics. How we understand and act toward others is the stuff of ethical living, and our greatest moral tests come in acting toward people different from us and who disagree with us. If the bitter history of Jewish persecution has taught us anything—both cognitively and viscerally—it is the importance of adhering to moral values when we deal with others. So how a Torah Jew living in the modern pluralistic world regards gentiles and how he or she should behave toward them are live issues today that flow naturally out of ethical concern. Of course we can always choose to hunker down in monolithic ghettos—even gilded suburban ones—and almost never come into serious contact with gentiles, thereby avoiding the practical issues relating to non-Jews and their faiths. This dynamic turns us inward spiritually so that we focus exclusively on ourselves and our own survival. We can choose to emulate the Amish—good people who simply wish for the world to leave them alone to live quietly among themselves. I have found that this strategy is rarely ethically neutral. In such a mode, it is too easy to become indifferent, callous, and even hateful toward those outside our culture. By not engaging gentiles panim el panim, we feel no accountability toward them as real human beings. Sometimes we objectify them by understanding them merely as theological or literary categories. And being unaccountable, we can too easily say incorrect and insensitive things about them, spin false hostile stereotypes, and even demonize them to strengthen our internal solidarity. In isolation, we are spared the need to empirically test our opinions or correct our prejudices. Unfortunately, many Orthodox leaders today have taken this turn, as if it somehow it demonstrates their Jewish bona fides. Worse, some of our centrist rabbinic leaders not only eschew goyim, they refuse to talk seriously with heterodox Jews, feminist Jews, Open Orthodox Jews, or secular authorities on social, ethical, or cultural matters. All this withdrawal comes at a terrible spiritual, moral, and intellectual cost. Theologically, it means giving up on God’s covenant with the Jewish people, which demands that Abraham’s children somehow be the agents of blessing to all humanity. This challenge was given to Abraham by God at the birth of the Jewish people: “Be a blessing…and through you all the nations of the earth will be blessed” (Gen. 12:1–3), and to Moses at Sinai: “You shall be for Me a mamlekhet kohanim”—a kingdom of priests” (Ex. 19:6). The primary functions of priests are blessing and teaching others, and if all Israel are priests, who is left for Israel to bless? It can only be the gentiles of the world. This covenantal demand was repeated to our prophets, who ask us in God’s name to “be a light unto the nations.” The Torah’s vision is for covenantal Jews to be central actors in human history—the central actors. All this is quite logical. Is it conceivable that the One Creator of Heaven and Earth, who is a “Rahaman al ha-kol,” would be concerned only with the welfare of .01% of His children, the Jews? If not, should we not emulate God’s pathos and involvement with all humans? God does not wish us to be “Amish with tzitzith,” focused exclusively on our own survival. He demands greater things, nobler things of us. I sense this instinctively and ache for my Jewishness to play a larger, more meaningful role. I yearn to expand my religious consciousness to my experiences with all human beings. Morally, withdrawal can easily induce a kind of numbness, a resolute blindness to ethical wisdom outside the bet midrash and impede developing sensitive caring for past largely ignored groups such as women, LGBT individuals, and oppressed people or disaster victims outside our community. And intellectually, refusing to engage seriously with people with whom we disagree stunts us. Humans learn by wrestling seriously with people who have different opinions. As R. Ovadia Mi-Bartenura understood, “[Only] through makhloket can truth emerge.” Makhloket is not a shallow verbal game played out in the halls of a yeshiva, but an arduous life commitment experienced in the living presence of those who think differently from us. True intellectual integrity entails never saying something that we would not defend in the presence of someone who disagrees with us. In the end, refusing to discuss vital spiritual and halakhic issues with knowledgeable dissenting others is a sign of tepid conviction, weak argument, and intellectual flimsiness. Perhaps all the harsh past gentile persecutions of Jews have so badly traumatized us that we now suffer from a form of “battered wife syndrome.” Yet this reflexive all-consuming inwardness was never the Torah’s ideal, and in America where anti-Semitism is no longer a substantive phenomenon, I see no need for a strategy of spiritual withdrawal and intellectual avoidance. I feel blessed to live today, in an era of miracles. One is the miracle of the Jewish people returning to their covenantal home and gaining sovereign independence in the Jewish State. A second is Christianity’s change toward Judaism and the Jewish people. Current Christian teachings about us were unimaginable to our grandparents and rabbis only two generations ago. And they have largely filtered down to create warm attitudes toward Jews among Christian religious leaders and laity in the West. It is not in our power to prevent you to go to Jerusalem, but we will never give our support. As the head of the Church, I cannot give you any other answer. The Jews do not recognize our Lord, hence we cannot recognize the Jewish people. When you come to Palestine, we will be there to baptize all of you. Only 96 years later, in March 2000, Pope John Paul II made an official visit to Israel, met with the Jewish State’s President and Chief Rabbis, and prayed at Jerusalem’s Western Wall for the welfare of the Jewish people as his elder brothers and who remain the people of God’s covenant. Christianity was deeply implicated in the infinite Jewish suffering during the Shoah. Its traditional supercessionist teachings toward Jews and Judaism were toxic and helped prepare European Christians to more easily accept the Nazi plan to exterminate Jews. After the war, many Christian thinkers from popes down through clergy and educated laypersons began a process of sincere din v’heshbon to examine Christianity’s role in this heinous event. This introspection resulted in a radical change in Christian theology regarding Jews and Judaism that began in the late 1950s and that continues unabated until today. One Christian theologian summed up present Catholic teachings about Jews as “the six R’s”: 1) the repudiation of anti-Semitism, (2) the rejection of the charge of deicide, (3) repentance after the Shoah, (4) review of teaching about Jews and Judaism, (5) recognition of Israel, and (6) rethinking of proselytizing Jews. This is nothing less than a Copernican revolution away from Christianity’s past hostile teachings about us. Today many believing Christians understand that their faith emerged from Judaism, that Jews remain God’s beloved chosen, that there is still a living covenant between God and the Jewish people, and that Christians cannot fully understand themselves without knowing more about us and our faith. Because of the horrible past we experienced at the hands of Christians, many Jews were rightfully skeptical at the start of this process regarding Christianity’s ability to do teshuvah. But any serious analysis of the facts today and the experience of warm relations between Jews and high Christian officials should convince us that the present is different from the past—and most importantly, that our grandchildren’s future with Christians can be much brighter than was our grandparents’ past. “Both of them wept”: Ya’akov also wept and felt brotherly compassion when Esav recognized the descendants and merits of Israel. When this occurs, then we, the people of Israel, will also recognize that Esav is indeed our brother too. All this has opened up the field of honest Jewish-Christian dialogue, on both universal practical and specific theological issues. Jews can approach Jewish-Christian dialogue without fear of Christians attempting to convert them. 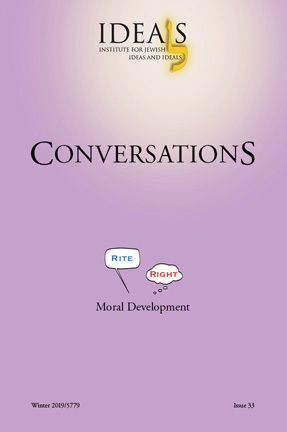 In fact, refraining from conversionary attempts is an explicit ground rule of dialogue. While most Orthodox Jews and their organizations still shun religious conversations with Christians as a matter of policy, there is no halakhic problem with interreligious relations and dialogue conducted under today’s parameters. The old fear was that discussing issues of faith with Christians could lead to conversion out of Judaism, but my experience has been precisely the opposite: Nearly every Jewish participant I know who has participated in dialogue with church officials has emerged with his/her faith strengthened and his/her Jewish identity reinforced. Interreligious dialogue is no longer a zero-sum affair, like theological disputation or debate. It is more accurately an expression of religious anthropology in which each side respectfully learns from the other and provides strength to live a religious life in the face of contemporary all-consuming materialistic culture. What a great irony it is that R. Joseph Soloveitchik, the great bard of spiritual loneliness who relentlessly sought for relief from this curse, opposed interfaith religious dialogue. Most of us who engage in this dialogue find some measure of relief from our spiritual loneliness when we engage pious Christians experiencing the same modern spiritual isolation. I have found this engagement spiritually liberating and edifying, broadening my horizons and sensitizing me to the divine spark in all God’s children and the wonder of how others reach for Eternity. Because thoughtful Modern Orthodox Jews are knowledgeable, God-oriented personalities, it is no accident that they have grown to constitute a near majority of Jewish participants in religious dialogue. They are questing God in every corner and in every possible experience, and religious Christians are seeking out Orthodox Jews specifically as their dialogue partners because they know them to be authentic representatives of Jewish tradition from whom they can learn both about Judaism and the dilemmas of modern spiritual life. Our struggles often mirror and illuminate theirs—and theirs, ours. Not long ago I experienced a touching moment at a conference in Salerno, Italy, where Orthodox rabbis and Catholic clergy spoke to more than 400 people for three days. Before the Catholic priests left to return home, they asked the rabbis to bless them. These priests understood the holiness of Jewish tradition and recognized that the Jewish people is dear to God and remain His chosen people. Affirming the present teachings of the Church, these priests understood that we are indeed a mamlekhet kohanim and they wanted us to bestow God’s blessing on them. It is a great privilege to live in an era that Netziv could only dream about more than 100 years ago. God has blessed us by bringing the Jewish people home and giving us Medinat Yisrael, as well as providing the opportunity for Christian reconciliation with Judaism and the Jewish people. Many Christians have gone from being our bitterest enemies to being our most understanding friends, and it is in both our religious and physical interests to realize that we no longer live in Rashbi’s era of Jewish-gentile warfare. The twin enemies of Christianity—radical jihadism from the right and radical secularism from the left—are also our enemies. In many ways religious Jews and Christians share the same spiritual universe and political challenges. On a practical level we help ourselves, Am Yisrael and Torat Yisrael when Jews learn about who Christians really are today and constructively interact with them. With this knowledge religious Jews can come to understand that as friends, Christians can be our allies against both the physical and religious challenges that face our people. Spiritually, I have learned that participating in serious Jewish-Christian engagement, has expanded my religious universe by opening up the possibility of finding my Creator in distant, unexpected corners of His universe, and providing me with the privilege of learning from and teaching all His children. I use the masculine “His” only as a stylistic device only. Of course, the Torah and our rabbis understood God to have both “masculine” and “feminine” characteristics, i.e., divinity is equally shared by both men and women. Examples abound. For lack of ethical wisdom, see 2010 Rabbinical Council of America report at http://www.hods.org/pdf/Determination%20of%20Death%20and%20Organ%20Transplantation%20-%20A%20Halakhic%20Study.pdf that forbade donating vital organs but allowed receiving such organs (p. 47). There is no way this position can be ethically justified according to the rules of moral discourse. Ethicists, the medical community and laypersons are almost unanimous in judging this position as unfair and immoral. Another example is found at (www.koltorah.org/index2.html — Vol. 17, No. 18; “Halachic Perspectives on Civilian Casualties” — Part 3), which claims that only one contemporary poseq (R. Aharon Lichtenstein) demands that Jews consider enemy civilian casualties when fighting a war according to halakhic standards. It concludes that normative halakha is consistent with the opinion that “according to the Torah worldview there is no concept of innocent civilians in an enemy population.” This violates the basis of just war ethics, which requires soldiers to distinguish between combatants and civilians when waging a moral war. For insensitivity and potential immorality toward LGBT community, see the petition at www.torahdec.org signed by 223 Orthodox rabbis—mostly Hareidi but also some prominent YU and RCA rabbis. It advocates therapy aiming to change a homosexual’s orientation to “a natural gender identity.” The American Psychological Association and medical professionals have concluded that there is no reliable data indicating that such therapy is effective. Still worse, there is significant evidence that this therapy causes serious harm to the patient. All these positions are indefensible in the public arena, and could not be sustained if Orthodox authorities would consider seriously the wisdom of outside experts. Finally, how many Orthodox rabbis evidence serious concern about the victims of the present massacres in Syria or the victims of tsunamis in Asia? The Diary of Theodore Herzl, Marvin Leventhal, ed., (Dial: 1956) pp. 429-430. This was made official by the Catholic Church’s Second Vatican Council document, Nostra Aetate (1965), and was followed by most other Western churches. Mary Boys, Has God Only One Blessing? (Paulist Press, 2000), pp. 247–256. These principles were outlined in Nostra Aetate. “Confrontation” does not contain any halakhic language or argumentation whatsoever. In some deep existential way, R. Soloveitchik may have understood this. Paradoxically, he delivered his most celebrated work, “The Lonely Man of Faith,” whose introduction concludes, ‘“I will speak that I may find relief;’ for there is a redemptive quality for an agitated mind in the spoken word…” at St. John’s Catholic Seminary in Brighton, MA. Among these Orthodox Jews are Rabbis Irving Greenberg, Shlomo Riskin, Daniel Sperber, David Rosen, Jonathan Sacks, Donniel Hartman, Yosef Laras, Pesach Wolicki, Rene Sirat, and me; Drs. Donniel Hartman and Alon Goshen Gottstein; Prof. Alan Brill. The Chief Rabbinate of Israel meets regularly with a delegation of Vatican clergy as well as with representatives of Protestant churches. In December 2012, more than 60 Orthodox rabbis around the world signed a statement promoting religious relations and interchange with Christians.